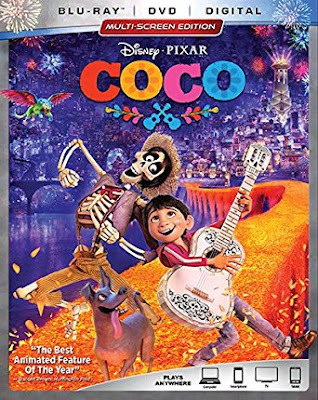 "Coco" tells the story of Miguel, a 12-year-old aspiring musician, who finds himself in the stunning and colorful Land of the Dead after a mysterious chain of events. This is the first-ever animated feature to include an almost entirely Latino voice cast, including many who reside and grew up in the City of Los Angeles. I LOVED everything about Coco. The movie got it's name Coco from the great-grandmother of Miguel who my daughter thought looked like a raisin. Coco sits and stares most of the time while the family move around her. When she was a baby, Coco's father, a Vagabond musician left his wife and daughter to live his musical dream. He is the black sheep of the family and since his leaving the family has never listened to music. It is in fact forbidden in the family which is unfortunate for Miguel because he loves music. He has crafted a guitar and has been keeping his secret by practicing his songs while watching the tapes of his idol, Ernesto de la Cruz who died suddenly by bell. YUP...a big bell fell on him while he was performing. Miguel's family makes shoes and have told him that he will also join the family making shoes! Miguel wants to perform and wants nothing to do with shoe making. Day of the Dead is the focus of the movie and the family are busy getting things ready for their dearly departed to come back. They are busying themselves with placing their ancestors favorite items on an alter when Miguel discovers that Ernesto de la Cruz may very well be his father. After all the photo of his grandfather is missing a face but the guitar is exactly like the one Ernesto played. Makes sense, why wouldn't he think this? When he steals the guitar from the singer's crypt he suddenly finds himself in the Land of the Dead and his mission is to find Ernesto to get his blessing to pursue his love of music because the rest of his ancestors will not allow it. Thankfully Miguel meets Hector who knows where de la Cruz is and always seems to "know a guy". Hector really wants to visit his family but every year he is forgotten. You see if your family doesn't put out your photo you can not leave the Land of the Dead. These two need each other and make a deal. Miguel learns things about his idol that changes what he originally thought of him and Hector's past is a sad one that made me tear twice. I think families will love this movie because the animation is off the hook. Truly beautifully done and there is even a memorable song called ironically Remember Me!